Locked for Region A. Will not play in Region B player and on-screen notice advises Region A only. The acclaimed detective series returns with more mysteries set in the uncertain days at the beginning of the Cold War. 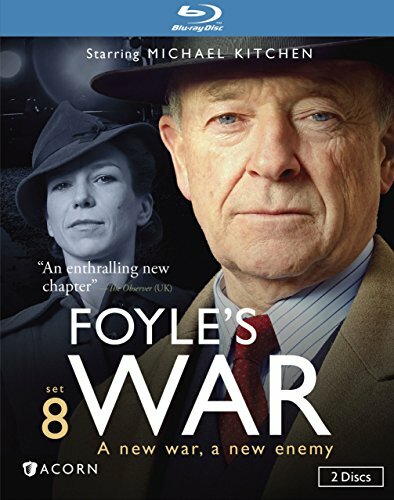 In 1946 London, former DCS Christopher Foyle (Michael Kitchen, Out of Africa) now employs his unerring investigative skills on behalf of MI5, assisted by his ever-faithful driver, Sam Wainwright (Honeysuckle Weeks, My Brother Tom). Also starring Daniel Weyman (Great Expectations), Ellie Haddington (Life Begins), Tim McMullan (The Woman in Black), Jeremy Swift (Oliver Twist), and Rupert Vansittart (Holy Flying Circus), with two-time Emmy® and Golden Globe® nominee John Mahoney (Frasier) as a guest star. High Castle-A translator for the Nuremberg trials is killed, leading Foyle into the world of international oil politics and corrupt Nazi businessmen. Trespass-The son of a prominent Jewish man is assaulted as a right-wing manifesto inflames anti-Semitic tensions. Elise-After an assassination attempt on Hilda Pierce, Foyle examines her SOE activities during the war and rumors of a traitor. Two hours of bonus features!